From the very first day you use them, the design challenges in this compendium will spur your students, too, to jump right in and engage throughout the entire class. The activities reinforce important science content while illustrating a range of STEM skills. 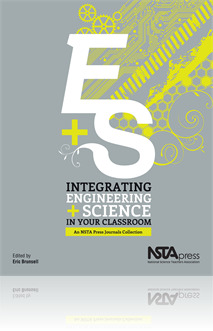 The 30 articles have been compiled from Science and Children, Science Scope, and The Science Teacher, NSTA’s journals for elementary through high school. •	Excite students of all ages with activities involving everything from light sabers and egg racers to prosthetic arms and potatoes. •	Apply to lessons in life and environmental science, Earth science, and physical science. •	Work well in traditional classrooms as well as after-school programs. A correction has been made to Chapter 9 in this book. To read the update, please click here: Integrating Engineering and Science in Your Classroom correction. The articles consider different approaches to learning, and explore the rationale behind choice of context and methodology as well as providing a useful bank of starter ideas. So why is this volume such a gem? Again I would go back to the quote in the introduction from the editor: The articles and the activities within these demonstrate that inclusion of engineering design into already established labs is not a burden but a logical extension of what students learn, how students should learn, and how they can apply their newfound knowledge and understandings. All of this occurs in one volume and that in and of itself makes it easy to learn, reference, and apply these concepts and practices.